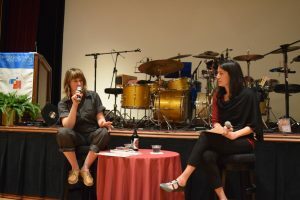 On March 29th, we were very fortunate to join the International House Global Voices Performing Arts & Lecture Series, the Arts, Science, and Culture Initiative, Phoenix Sustainability Initiative, and Bart Lazar in hosting Lisa Schonberg and the Secret Drum Band for an evening of exciting events. 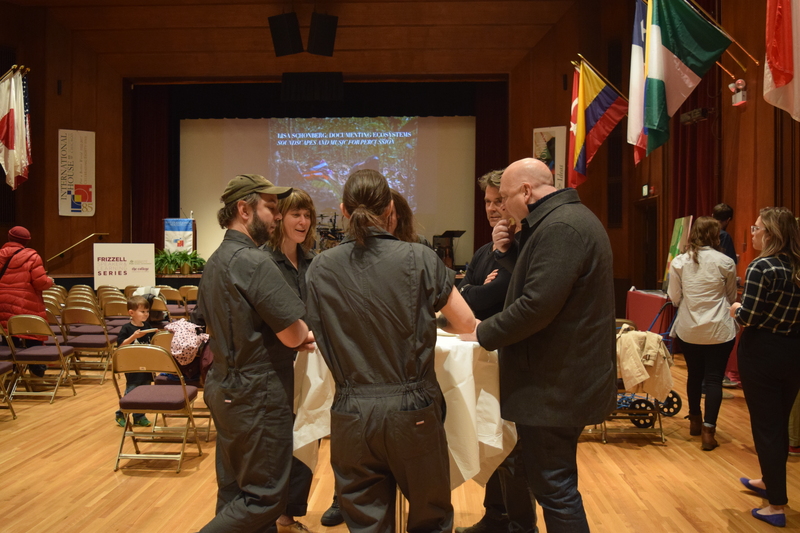 The evening began with a reception featuring students exhibiting their art and environmental projects, and was followed by a lecture by Lisa Schonberg entitled Documenting Ecosystems: Soundscapes and Percussion Composition. 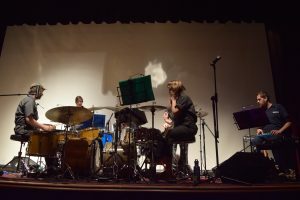 The event concluded with a fantastic and exhilarating performance by the Secret Drum Band, one of Lisa’s bands that is based in Portland, Oregon and is currently on national tour. 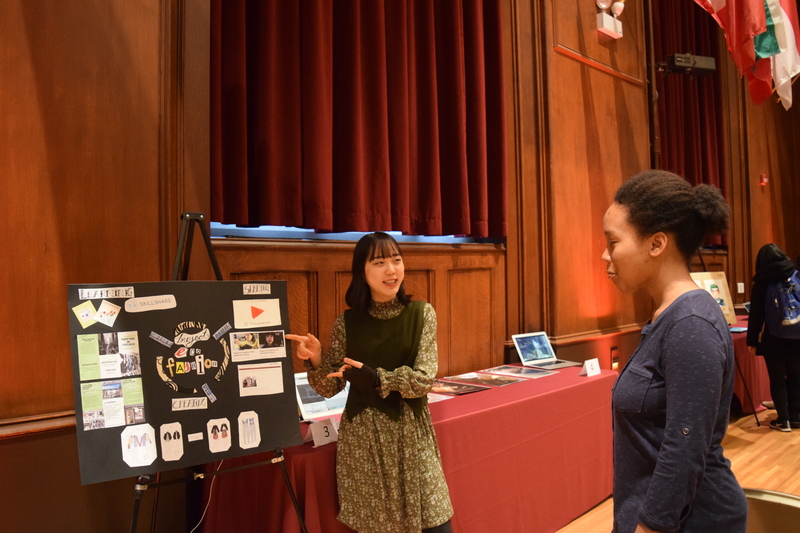 The student showcase featured 12 exhibitors from the College, UChicago Laboratory (Lab) Schools, and the School of the Art Institute of Chicago (SAIC). Each exhibitor shared a unique project that highlighted the intersection of art and the environment, keeping in theme with Lisa Schonberg’s work. Some students displayed photos of landscapes or natural elements from their travels and experiences. Others brought paintings that expressed an environmental theme. Sixth grade students in a sustainability class at the Lab School constructed a sea otter out of recycling items in order to raise awareness about how plastic waste can significantly harm ocean life. A student at SAIC showcased a sculpture of repurposed empty beer cans; vibration motors inside of the cans that were activated via a networked Wi-Fi module created a distinctive percussive experience, somewhat reminiscent of Lisa’s own work and the Secret Drum Band. One student displayed her sustainable fashion project, and another brought samples of Frönen, the healthy dessert alternative he developed that is made of upcycled ingredients. Attendees of the reception and showcase were able to vote for their favorite exhibit using beans, which provided a zero-waste alternative to voting with paper ballots. 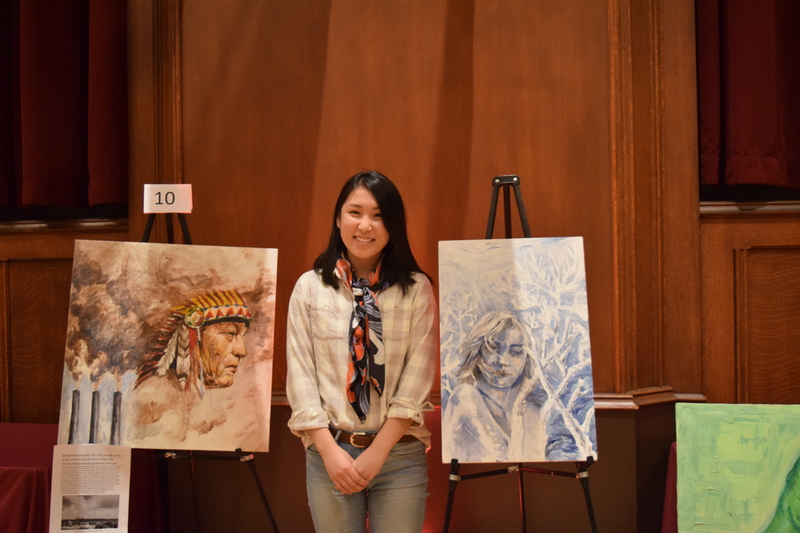 Ultimately, Amy Tian, a first year in the College, was the winner of the showcase. She presented two paintings entitled “Today.” I was extremely impressed by all of the exhibitors’ extreme talent, and Lisa mentioned after the event how thrilled she was to see so many students passionate about both environmental issues and the arts. Hopefully in the future, UChicago can host more events like this one, where students are able to show off their creativity and visions in the areas of arts and the environment. During her lecture, Lisa discussed her background and how she became interested in art, music, and the environment. She explained in more detail some of the different projects in which she has been involved, aiming to raise awareness about environmental issues such as threats to public lands, habitat loss, and endangered species. 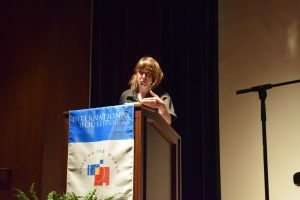 She explained her involvement in the Hylaeus Project, in which she worked with artist Aidan Koch in documenting the rare native Hawaiian Hylaeus bees. The team petitioned on behalf of the bees’ survival to the U.S. Fish and Wildlife Service , which listed the species as endangered in 2016. Lisa’s work helped to educate the public about this very small but important species of bees, and the team published an illustrated book called The Hylaeus Project. Lisa also compiled a set of music compositions based on the bees and their various habitats for the Secret Drum Band. The band played some of these compositions during the concert that followed the lecture. Lisa also talked extensively about the work she conducted last summer as an artist in residence with Labverde in the Brazilian Amazon. While there, she made audio recordings of ants and their habitats, highlighting the incredible contributions that ants make to maintaining rainforest ecosystems, such as herbivory, seed dispersal, predation, and decomposition. Similarly to the Hylaeus Project, Lisa composed percussion and ambient music based on these recordings. She played some of these recordings for us during the lecture, and then later, the Secret Drum Band played the composed musical interpretation of the recordings. It was fascinating to hear the transformation, and yet it was possible to still identify the ant sounds at the root of the songs. One thing that stood out to me was during the Q&A after the lecture when Sabina asked Lisa what advice she has for students who are interested in pursuing the arts as a method for environmental activism, which can often be difficult as a result of limited funding. She responded with a simple, yet profound answer, and encouraged students to create their own opportunities, to tell people what they are doing, and “just ask,” because you never know where there are chances to get involved or who is willing to support your endeavors. The performance by the Secret Drum Band was absolutely incredible. I had never heard a band play that was comprised solely of drums, and going into the concert, I wasn’t sure what to expect. I was completely blown away by the talent of Lisa and her bandmates. For each song, the band members rotated to different instruments, and throughout, their passion about music and the compositions they’ve made was clear. I am so glad that we had the amazing opportunity to bring the Secret Drum Band to campus, and it was certainly an experience that I will never forget. We ran this event as zero waste, where we attempted to send as little waste as possible to landfill. Throughout the evening, students from the Frizzell Series and the Environment, Agriculture, and Food group managed two “Weigh the Waste” stations, where they helped ensure that food waste and other waste were properly sorted into either compost, landfill, and recycling. We catered from Good Earth Catering Company, and they provided compostable utensils, plates, cups, and napkins. Our composting bins were from Healthy Soil Compost, and the University’s waste and recycling vendor Lake Shore Recycling took the recycling. During the event, we collected 4.6 total pounds of waste: 3.3 pounds of compost, 0.9 pounds of recycling, and 0.4 pounds of landfill. We are very excited that more than 91% of waste was composted or recycled, while less 9% of waste went to the landfill. Overall, this was an incredible event, and I am so honored to have been part of the planning and execution process. I am looking forward to the events that we and our partners have lined up for the rest of the year! Caitlin is a fourth year Economics and Public Policy major in the College. She currently serves as the student coordinator of the Frizzell Speaker and Learning Series and the Environment, Agriculture, and Food Working Group.